This category includes the pressure stainless steel tanks with the horizontal orientation including the PUR insulation and the cooling channels in the double jacket. Recommended cooling media – water with polypropylenglycol. All the tanks are equipped with the fermentation control mechanism for fine adjusting of pressure in the tanks. Temperature may to be easily regulated with the local or central control system. The Combi Maturation Tank & Bright Beer Tank (horizontal construction, with insulation, cooled by ice water or glycol) with usable volume 150 liters and total volume 164 liters for maturation , tapping, carbonation of beer, cider, wine and other beverages, and also for production of beverages before their bottling or filling into kegs in several variations, made of stainless food steel DIN 1.4301 (AISI 304). This tank is equipped with insulation and glycol cooling channels. It is designed for cooling by cold water or glycol. For cooling of beer is necessary to connect it to water (or glycol) cooler with cooling medium circulation pump. 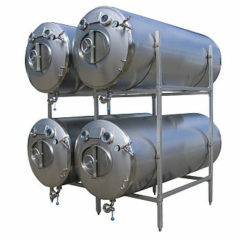 The Combi Maturation Tank & Bright Beer Tank (horizontal construction, with insulation, cooled by ice water or glycol) with usable volume 200 liters and total volume 218 liters for maturation , tapping, carbonation of beer, cider, wine and other beverages, and also for production of beverages before their bottling or filling into kegs in several variations, made of stainless food steel DIN 1.4301 (AISI 304). This tank is equipped with insulation and glycol cooling channels. It is designed for cooling by cold water or glycol. For cooling of beer is necessary to connect it to water (or glycol) cooler with cooling medium circulation pump. The Combi Maturation Tank & Bright Beer Tank (horizontal construction, with insulation, cooled by ice water or glycol) with usable volume 250 liters and total volume 273 liters for maturation , tapping, carbonation of beer, cider, wine and other beverages, and also for production of beverages before their bottling or filling into kegs in several variations, made of stainless food steel DIN 1.4301 (AISI 304). This tank is equipped with insulation and glycol cooling channels. It is designed for cooling by cold water or glycol. For cooling of beer is necessary to connect it to water (or glycol) cooler with cooling medium circulation pump.. The Combi Maturation Tank & Bright Beer Tank (horizontal construction, with insulation, cooled by ice water or glycol) with usable volume 100 liters and total volume 110 liters for maturation , tapping, carbonation of beer, cider, wine and other beverages, and also for production of beverages before their bottling or filling into kegs in several variations, made of stainless food steel DIN 1.4301 (AISI 304). This tank is equipped with insulation and glycol cooling channels. It is designed for cooling by cold water or glycol. For cooling of beer is necessary to connect it to water (or glycol) cooler with cooling medium circulation pump. The Combi Maturation Tank & Bright Beer Tank (horizontal construction, with insulation, cooled by ice water or glycol) with usable volume 300 liters and total volume 327 liters for maturation , tapping, carbonation of beer, cider, wine and other beverages, and also for production of beverages before their bottling or filling into kegs in several variations, made of stainless food steel DIN 1.4301 (AISI 304). This tank is equipped with insulation and glycol cooling channels. It is designed for cooling by cold water or glycol. For cooling of beer is necessary to connect it to water (or glycol) cooler with cooling medium circulation pump. The Combi Maturation Tank & Bright Beer Tank (horizontal construction, with insulation, cooled by ice water or glycol) with usable volume 400 liters and total volume 436 liters for maturation , tapping, carbonation of beer, cider, wine and other beverages, and also for production of beverages before their bottling or filling into kegs in several variations, made of stainless food steel DIN 1.4301 (AISI 304). This tank is equipped with insulation and glycol cooling channels. It is designed for cooling by cold water or glycol. For cooling of beer is necessary to connect it to water (or glycol) cooler with cooling medium circulation pump. The Combi Maturation Tank & Bright Beer Tank (horizontal construction, with insulation, cooled by ice water or glycol) with usable volume 500 liters and total volume 545 liters for maturation , tapping, carbonation of beer, cider, wine and other beverages, and also for production of beverages before their bottling or filling into kegs in several variations, made of stainless food steel DIN 1.4301 (AISI 304). This tank is equipped with insulation and glycol cooling channels. It is designed for cooling by cold water or glycol. For cooling of beer is necessary to connect it to water (or glycol) cooler with cooling medium circulation pump. The Combi Maturation Tank & Bright Beer Tank (horizontal construction, with insulation, cooled by ice water or glycol) with usable volume 600 liters and total volume 654 liters for maturation , tapping, carbonation of beer, cider, wine and other beverages, and also for production of beverages before their bottling or filling into kegs in several variations, made of stainless food steel DIN 1.4301 (AISI 304). This tank is equipped with insulation and glycol cooling channels. It is designed for cooling by cold water or glycol. For cooling of beer is necessary to connect it to water (or glycol) cooler with cooling medium circulation pump. The Combi Maturation Tank & Bright Beer Tank (horizontal construction, with insulation, cooled by ice water or glycol) with usable volume 750 liters and total volume 818 liters for maturation , tapping, carbonation of beer, cider, wine and other beverages, and also for production of beverages before their bottling or filling into kegs in several variations, made of stainless food steel DIN 1.4301 (AISI 304). This tank is equipped with insulation and glycol cooling channels. It is designed for cooling by cold water or glycol. For cooling of beer is necessary to connect it to water (or glycol) cooler with cooling medium circulation pump. The Combi Maturation Tank & Bright Beer Tank (horizontal construction, with insulation, cooled by ice water or glycol) with usable volume 1500 liters and total volume 1635 liters for maturation , tapping, carbonation of beer, cider, wine and other beverages, and also for production of beverages before their bottling or filling into kegs in several variations, made of stainless food steel DIN 1.4301 (AISI 304). This tank is equipped with insulation and glycol cooling channels. It is designed for cooling by cold water or glycol. For cooling of beer is necessary to connect it to water (or glycol) cooler with cooling medium circulation pump. The Combi Maturation Tank & Bright Beer Tank (horizontal construction, with insulation, cooled by ice water or glycol) with usable volume 1000 liters and total volume 1090 liters for maturation , tapping, carbonation of beer, cider, wine and other beverages, and also for production of beverages before their bottling or filling into kegs in several variations, made of stainless food steel DIN 1.4301 (AISI 304). This tank is equipped with insulation and glycol cooling channels. It is designed for cooling by cold water or glycol. For cooling of beer is necessary to connect it to water (or glycol) cooler with cooling medium circulation pump. The Combi Maturation Tank & Bright Beer Tank (horizontal construction, with insulation, cooled by ice water or glycol) with usable volume 1200 liters and total volume 1308 liters for maturation , tapping, carbonation of beer, cider, wine and other beverages, and also for production of beverages before their bottling or filling into kegs in several variations, made of stainless food steel DIN 1.4301 (AISI 304). This tank is equipped with insulation and glycol cooling channels. It is designed for cooling by cold water or glycol. For cooling of beer is necessary to connect it to water (or glycol) cooler with cooling medium circulation pump. The Combi Maturation Tank & Bright Beer Tank (horizontal construction, with insulation, cooled by ice water or glycol) with usable volume 2000 liters and total volume 2180 liters for maturation , tapping, carbonation of beer, cider, wine and other beverages, and also for production of beverages before their bottling or filling into kegs in several variations, made of stainless food steel DIN 1.4301 (AISI 304). This tank is equipped with insulation and glycol cooling channels. It is designed for cooling by cold water or glycol. For cooling of beer is necessary to connect it to water (or glycol) cooler with cooling medium circulation pump. The Combi Maturation Tank & Bright Beer Tank (horizontal construction, with insulation, cooled by ice water or glycol) with usable volume 2500 liters and total volume 2725 liters for maturation , tapping, carbonation of beer, cider, wine and other beverages, and also for production of beverages before their bottling or filling into kegs in several variations, made of stainless food steel DIN 1.4301 (AISI 304). This tank is equipped with insulation and glycol cooling channels. It is designed for cooling by cold water or glycol. For cooling of beer is necessary to connect it to water (or glycol) cooler with cooling medium circulation pump. The Combi Maturation Tank & Bright Beer Tank (horizontal construction, with insulation, cooled by ice water or glycol) with usable volume 3000 liters and total volume 3270 liters for maturation , tapping, carbonation of beer, cider, wine and other beverages, and also for production of beverages before their bottling or filling into kegs in several variations, made of stainless food steel DIN 1.4301 (AISI 304). This tank is equipped with insulation and glycol cooling channels. It is designed for cooling by cold water or glycol. For cooling of beer is necessary to connect it to water (or glycol) cooler with cooling medium circulation pump. The Combi Maturation Tank & Bright Beer Tank (horizontal construction, with insulation, cooled by ice water or glycol) with usable volume 4000 liters and total volume 4360 liters for maturation , tapping, carbonation of beer, cider, wine and other beverages, and also for production of beverages before their bottling or filling into kegs in several variations, made of stainless food steel DIN 1.4301 (AISI 304). This tank is equipped with insulation and glycol cooling channels. It is designed for cooling by cold water or glycol. For cooling of beer is necessary to connect it to water (or glycol) cooler with cooling medium circulation pump. The Combi Maturation Tank & Bright Beer Tank (horizontal construction, with insulation, cooled by ice water or glycol) with usable volume 5000 liters and total volume 5450 liters for maturation , tapping, carbonation of beer, cider, wine and other beverages, and also for production of beverages before their bottling or filling into kegs in several variations, made of stainless food steel DIN 1.4301 (AISI 304). This tank is equipped with insulation and glycol cooling channels. It is designed for cooling by cold water or glycol. For cooling of beer is necessary to connect it to water (or glycol) cooler with cooling medium circulation pump. The Combi Maturation Tank & Bright Beer Tank (horizontal construction, with insulation, cooled by ice water or glycol) with usable volume 7000 liters and total volume 7630 liters for maturation , tapping, carbonation of beer, cider, wine and other beverages, and also for production of beverages before their bottling or filling into kegs in several variations, made of stainless food steel DIN 1.4301 (AISI 304). 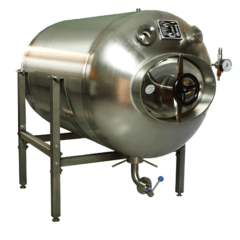 This tank is equipped with insulation and glycol cooling channels. It is designed for cooling by cold water or glycol. For cooling of beer is necessary to connect it to water (or glycol) cooler with cooling medium circulation pump.